The Only Face Saving CryptoCoin in the Market Currently! As you're already aware of the falling crypto market, it seems that no coin is averse to it. Coins are at almost 50% or even lower of their recent high in anticipation of the Bitcoin Soft/HardFork scheduled for the 01st of Aug. The Market Cap for all the coins put together was at an all time high of around $110 billion USD only a couple of weeks ago and today it's down to about less than $80 billion USD. That's a wipe out of about $30 billion USD which is massive, it's almost a fall of about 30% in the course of about a week. These are comparable to recession times of the traditional share markets. If this was to happen in the traditional market, there'd be panic in the world, with the Governments trying to inject cash into the market and trying everything possible to reverse the situation. I've experienced it first hand in Australia in 2007-2008 when the Sup-Prime crisis hit our economy really hard. Aussie government had to move in to save the banks because people were just withdrawing too much cash from the banks and it could have led to the banks becoming bankrupt. The Aussie government also stopped the short selling of shares by some big brokers to protect the small share holders. Now if there's a saving grace in this bloodbath, it's this one coin in particular that's catching the attention of a lot of people. Chaincoin has risen from the lows of 8 cents on June the 12th to about 90 cents when I just checked. Now some people will call it a pump and dump scheme but this coin doesn't seem to fit the bill for such scheme. It was basically brought to the forefront by a group of people who were looking for a great investment coin that can withstand these troubling times. Even though it's been in existence for the last 3 years, people just missed it until it was found a week or so ago. The above has been taken from their website and as you can see it's a mineable coin. Plus you can setup it's masternode if you own just 1000 Chaincoins, which is unbelievable with it's current price. Another aspect of this coin is that it's based on the same hashing algorithm as DASH, which has exploded in value during the last couple of months. So this is a very undervalued coin in my opinion and it could reach double/triple figures in the coming few months. See the below screenshot from it's website. I've always wanted to setup a masternode of a coin but other coins like DASH(1000 coins) or PIVX (10,000 coins )that offer masternodes are now so high in price that I can't afford it. I'm now considering very seriously to buy 1000 Chaincoins to setup my first masternode. And the great thing is that I can set it up on a Windows 10 PC. There's a great step by step tutorial to setup Chaincoin masternode on Windows 10, posted by @jeffblogs . See it Here. As per the below screenshot you can see that their masternode provides a good return on investment. 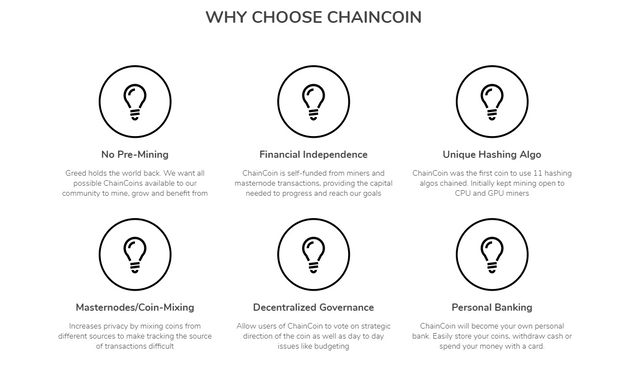 I'm pretty sure there're others out there who've always wanted to setup their own masternodes, so this is your opportunity to get into Chaincoin before its value explodes. Seems like it's doing pretty good. Yep, I'm glad I got into this whiles I did. Looking very promising for the future. I'm just being wary of the pumpers and dumpers and HODL'ing it all of the way up! This post has received a 3.34 % upvote from @booster thanks to: @cryptodog. This post received a 4.3% upvote from @randowhale thanks to @cryptodog! For more information, click here!